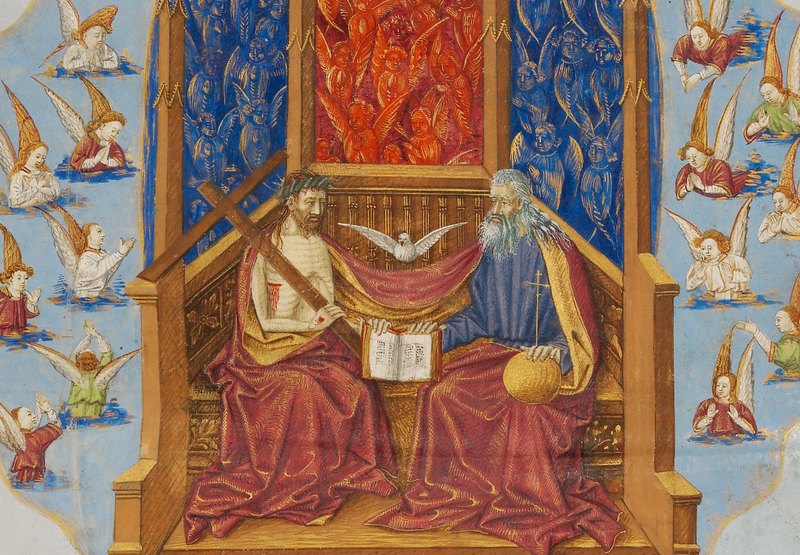 Today we celebrate the central mystery of the Christian faith, and one that sets us apart from every other religion: the Holy Trinity – One God in Three Persons: Father, Son and Holy Spirit. Our religious order also celebrates the tradition of renewing our vows communally on this day. We think of today’s feast as the gateway to a slew of solemnities and feasts which occur after the close of the Easter season: Corpus Christi, the Sacred Heart of Jesus, the Immaculate Heart of Mary, St. John the Baptist, and Sts. Peter and Paul. In the monastery all these celebrations can be a little exhausting, but we are grateful for the wisdom of the liturgical calendar, which gives us times of “ordinary” joy, and times of extraordinary joy. Today we celebrate the feast of the Holy Trinity, that reminds of the mystery of the one God in three Persons: the Father, the Son and the Holy Spirit. The Trinity is the communion of Divine Persons who are with one another, for one another, in one another: this communion is the life of God, the mystery of love of the Living God. But who has revealed to us this mystery? Jesus. He has spoken to us about God as a Father; He has spoken to us of the Spirit; and He has spoken to us of Himself as the Son of God.Thus, He has revealed to us this mystery. And when risen [from the dead], He sent his disciples to evangelize the people, telling them to baptize “in the name of the Father and of the Son and of the Holy Spirit” (Mt. 28,19). Christ entrusts this command in every time to the Church, who inherited from the Apostles the missionary mandate. He addresses also to each one of us who, by virtue of Baptism, are part of his Community. Therefore, today’s liturgical solemnity, while it makes us contemplate the wonderful mystery from which we come from and where we go towards, renews in us the mission of living in communion with God and to live in communion among ourselves on the model of that communion of God. We are called to live not without each other, over or against the other, but with one another, and in one another. This means to receive and accordingly give witness to the beauty of the Gospel; to live in love mutually and towards all, sharing in joy and sufferings, learning to ask and to grant forgiveness, valuing the various charisms under the guidance of the Pastors. In one word: we are entrusted with the task of building ecclesial communities that is more and more a family, capable of reflecting the splendor of the Trinity and to evangelize not only with words, but with the strength of the love of God that lives in us. The Trinity, as I mentioned, is also the ultimate goal toward which our earthly pilgrimage is geared. The path of Christian life is in fact a path that is essentially ”trinitarian”: the Holy Spirit guides us to full knowledge of the teachings of Christ. And it also reminds us of what Jesus taught us. And Jesus, for his part, has come to the world to make us know the Father, to be lead by Him, to reconcile us with Him. Everything, in Christian life, revolves around the mystery of the Trinity and is fulfilled in this infinite mystery. Let us look, therefore, to keep high the “tone” of our life, reminding ourselves to what end, for what glory we exist, work, struggle, suffer; and to which immense prize we are called [to have]. This mystery embraces our whole life and our whole Christian life. We must remind ourselves every time we make the sign of the Cross: in the name of the Father, and of the Son, and of the Holy Spirit. And now I invite you, all together, and with a loud voice, to make this sign of the Cross. Everyone together! In this last day of May, the Marian month, we entrust ourselves to the Virgin Mary. May She, who more than any other creature has known, adored, and loved the mystery of the Most Holy Trinity, guides us by the hand; help us to grasp, in the events of the world, the signs of the presence of God: Father, Son and Holy Spirit. May She helps us to love Jesus wholeheartedly, to walk towards the vision of the Trinity, wonderful goal to which our lives are geared toward. We also ask Her to help the Church, that it may be a mystery of communion, to be always a Church community, a hospitable community, where every person, especially the poor and marginalized, can find acceptance and that feels like a daughter of God, wanted and loved. Today in Bayonne, in Francis, the priest Louis-Edouard Cestac was proclaimed Blessed; the founder of the Servant Sisters of Mary; his witness of the love of God and neighbor is a new stimulus for the Church to live with joy the Gospel of charity. I greet you all, dear Romans and pilgrims: the families, the parish groups, the associations, the schools. In particular, i greet the faithful of La Valletta (Marlta), Cáceres (Spain) and Michoacán (Mexico); those who have come from Caltanissetta, Soave, Como, Malonno and Persico Dosimo; and the group from Bovino, with the “Knights of Valleverde”. I greet the youth who have received or are preparing to receive Confirmation, encouraging them to be joyful witness of Jesus. Next Thursday in Rome, we will live the traditional procession of Corpus Domini. At 7:00pm in St. John Lateran Square I will celebrate the Holy Mass, and then we will adore the Most Blessed Sacrament walking to the square of Saint Mary Major. I invite you now to participate in this solemn public act of faith and love to Jesus in the Eucharist, present in the midst of His people. Before ending, let us all one more time and in one loud voice say: in the name of the Father, and of the Son and of the Holy Spirit, remembering the feast of the Holy Trinity. To all I wish you a good Sunday. Please, do not forget to pray for me. Have a good lunch and goodbye. This entry was posted in Pope Francis, The Church and tagged Angelus Address, Pope Francis, the Trinity, Trinity Sunday by texasnuns. Bookmark the permalink. I can now be “grateful for the wisdom of the liturgical calendar” because you expressed that here. This year I felt a wisp of sadness at the end of Lent but quickly set my mind to the joy of the Resurrection! Then as the green vestments became witness to Ordinary time, I felt that wisp again. Now (see first sentence). Thank you, Sisters!